People put their faith in the strangest things. Some feel their god will return to cast down judgment on humankind. Others are certain beings from another solar system planted genetic material on Earth to create life. And some believe, or perhaps not, that a flying spaghetti monster lives in the sky. Here’s another one: Folk music history tells us a train called the Southern Pacific Golden Gate Limited ran near Sugar Land prison in Texas, where legendary Blues man Lead Belly heard it passing. He and other inmates believed the train represented some sign of hope that soon they would be set free. Lead Belly later popularized a song about it, called “Midnight Special”, featuring a lyric in which he asks the train to “shine a light on me”. Apart from memorable covers by Harry Belafonte, Bob Dylan, and Credence Clearwater Revival, Lead Belly’s folk song informs the title of writer-director Jeff Nichols’ fourth film, Midnight Special. People in the film believe some strange things, too. Some of them believe a young boy will grant their way to salvation, while the government believes that same boy is a threat to national security. But more on the specifics later. These belief systems pervade Nichols’ screenplay, a slow-burner infused with soulful character depth and science-fiction underpinnings. 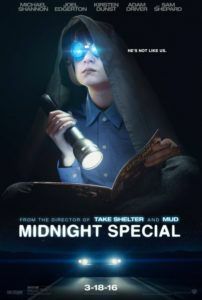 Midnight Special has much in common with Nichols’ excellent Take Shelter (2011), about a working-class family plagued by the father’s apocalyptic premonitions. That otherwise grassroots, southern-fried suspenser contains fantastical elements, though really it’s about the extremes people will go to chase what they believe. Nichols has explored similar American spirituality in his other two films, Shotgun Stories (2007) and Mud (2011). 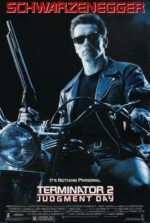 Each of his films demonstrates the potential danger inherent to blindly following our beliefs and convictions. Nichols’ calculated opening demands the audience take time to figure out what’s happening and why, who the good guys are, and in the end, what just came to pass. It’s a picture audiences must feel their way through in the best possible way. An Amber Alert blares across the television screen, a reporter notifying us a young boy named Alton has been kidnapped by a man named Roy. As the shot pulls back, we find ourselves in a motel room with Roy (Michael Shannon, severe as ever) and Alton (Jaeden Lieberher), who, behind an ever-present pair of swimming goggles, reads a comic book by flashlight. Also in the room is a crew-cut man of action, Lucas (Joel Edgerton). They’re waiting until the sun goes down to continue their getaway. Lucas drives fast and without headlights, wearing night vision headgear to see the highway in the pitch dark. Nichols cross-cuts to things at “The Ranch”—a Texas compound not unlike David Koresh’s Branch Davidians—populated by old-world types in hand-sewn garb. They’re led by a quietly intense organizer named Calvin (Sam Shepard), who wants Alton returned to him. The FBI raids The Ranch and puts everyone on buses to a secure location. They ask questions about Calvin’s people buying guns and about Alton’s kidnapping. A bookish NSA specialist named Sevier (Adam Driver) wants to know about Alton, who came in contact with him, and what they know about the boy’s abilities. And so we must wonder, why so many questions about this boy? The answer: When Alton is exposed to the sun, beams of light shoot from his eyes; he seems to speak in tongues; he can give people visions; in space, satellites meant to detect nuclear explosions spy an energy source emitting from him; he also picks up radio signals in his head. But what is he? Nichols never answers that question outright. Over time, we learn Roy is Alton’s father, and Lucas is Roy’s friend, and together they’re protecting Alton from The Ranch and the government. All parties concerned feel a great power exists inside the boy and, though they don’t completely understand it, they fearfully pursue and defend him. Soon Alton’s mother (Kirsten Dunst) joins Roy and Lucas, aware of the entire plan. We learn all of Alton’s peculiarities have a hidden encryption, coordinates that point to a certain spot on a specific day. Everything depends on getting him there on time. And gradually, as men from The Ranch get closer to recapturing Alton, and the government goons track down their perceived threat, we get a greater—but not clearer—sense of what might occur if and when Alton arrives at his destination. Rather than frustrating, that lack of transparency is engrossing, as Nichols drops hints here and there, while he binds us to the often moving, unquestionably engaging proceedings through subtle character work. So what is Alton? He finds great interest reading a Superman comic, so perhaps he’s something like Superman, a powerful alien. Perhaps he’s a messiah sent to protect people at The Ranch. Maybe he’s an advanced form of human with mutant powers, a time traveler, a living weapon, or an inter-dimensional being. Whatever the answer, it’s less important than the real-life descriptions of the humans on Nichols’ journey. His actors carry impressive weight and gravitas, particularly Shannon, who has appeared in each of Nichols’ films. But the entire cast brings substance to their performances, involving the audience in the tense, measured development of the story. Both narratively and technically, Nichols has used the films of Steven Spielberg and John Carpenter to inform Midnight Special, but not in such a way that it feels distractingly derivative. 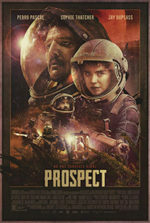 From the perspective that the film operates as a road movie driving toward some manner of grandiose sci-fi conclusion, the film feels like Close Encounters of the Third Kind; the ending, too, resembles Spielberg’s wondrous 1977 effort. Elsewhere, Starman (1984) comes into play, as everyone who meets Alton gravitates to his kindness, soulful sureness, and power, just as everyone in Carpenter’s film found Jeff Bridges’ alien character a kind of angelic figure. Even the ending seems to combine the finales of these two films, with a touch of E.T. : The Extra-Terrestrial. 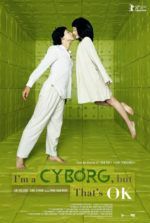 The film also bears some similarity to Tomorrowland, although the association is undoubtedly unintentional. All the while, Adam Stone’s textured 35mm lensing captures familiar lens flares and widescreen compositions from Carpenter and Spielberg that influenced Nichols. Questions about what happens in its marvelous climactic scenes aside, Midnight Special shines a light on the audience by offering a unique combination of the realistic and out-of-this-world. Nichols develops thoroughly dimensional characters, even among the not-irredeemable “villains” of the story. The director cares about Roy’s heavy brow and Sevier’s sense of unsure awe; with them, he develops intimate moments that effectively resonate further than the sci-fi gimmick. He never overplays the drama, such as a scene in which Alton tells his father not to worry about him. Roy replies, “I like worrying about you.” The understatedness of Nichols’ drama, the poignancy, renders a picture about how people react to what they believe or do not understand. Some embrace it; some fear it. No matter the reaction, Nichols finds a way to represent that through an engaging metaphor in his profoundly affecting and, in many ways extraordinary thriller.